A hotel kitchen is a bustling environment that is often filled with hurrying, rushing staff members trying to accomplish a multitude of tasks in a short period of time. Because of this chaotic environment, hotel kitchens are notorious for being filled with safety hazards. When safety is neglected, an easy thing to do in a chaotic kitchen, the quality of the hotel dining establishment will begin to suffer. Here are a few safety hazards that can be eliminated in a hotel kitchen. 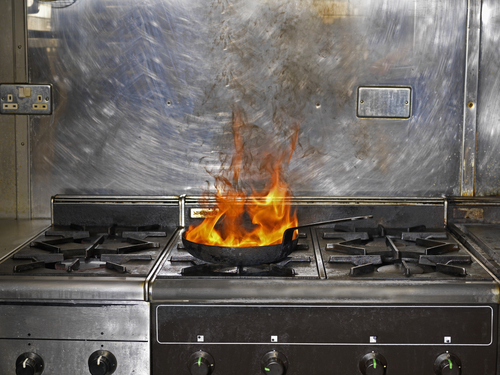 Fire hazards are the most common safety hazards in a hotel kitchen. Humongous stoves and ovens that generate astonishingly high energy outputs can be quite dangerous if left unattended or used by an inexperienced staff member. Not only can these hazards lead to serious burns, but they can also cause an outbreak of uncontrollable fire or even an explosion if cooking appliances are not monitored at all times. Train your staff regarding hotel stove and oven safety in order to reduce the occurrence of fire and burning hazards. Another common hazard in a hotel kitchen environment is a tripping hazard. Tripping over obstructions left in kitchen pathways can lead to falls, spilled food, and even serious burns if an employee is carrying hot dishes. Overcrowding hazards are caused when staff members are not taught to stay in their stations or when a hotel kitchen is simply overstaffed. Reducing staff numbers and keeping pathways clear of obstructions will eliminate these hazards. Surprisingly, one of the most effective ways to boost safety standards within your hotel's kitchen is simply to hire the right individuals to manage the rest of your kitchen staff. In several research studies, the frequency of kitchen injuries in restaurant kitchens could be directly linked to the quality of management within the kitchen. With good management, issues will be quickly resolved, and most health and safety hazards will be removed before they even become a problem. On the other hand, bad management can cause issues such as safety neglect, irresponsibility, and even the blatant disregard of safety guidelines and standards. Spend time hiring the right people to manage your hotel's kitchen. Choose individuals who have experience managing a staff. A good worker does not necessarily make a good manager. Individuals who are capable of managing themselves and their own specifically assigned tasks may not have the skills necessary to manage the tasks of a group of people. Good managers need to be clear communicators, responsible individuals, and people who are able to command respect and be authoritative. Safety hazards in a hotel kitchen can cause a heap of problems for your hotel restaurant or dining area. When you kitchen is unsafe, your hotel may be liable for any and all injuries that occur on the premises. A kitchen that is full of safety hazards is also incapable of providing high quality meals to diners with anything remotely resembling efficiency. Remove safety hazards from your kitchen, and you will see customer satisfaction start to climb.